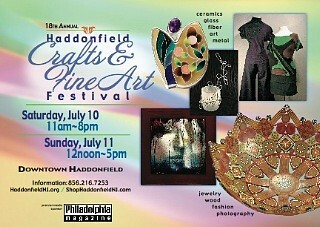 I will be exhibiting at the 18th Annual Haddonfield (NJ) Crafts and Fine Art Festival on Saturday July 10 and July 11 and am honored to be one of the artists highlighted on the flyer (see below). With Kings Highway and Tanner Street closed to vehicular traffic, this annual event features work from more than 250 artists from around the country, outdoor cafes and live music. The Festival hours are 11 am to 8 pm on Saturday, 12 noon to 5 pm on Sunday. Please stop by and say hello.